A regional Southern American English consolidated and expanded throughout all the traditional Southern States since the last quarter of the nineteenth century until around World War II, largely superseding the older Southern American English dialects. With this younger and more unified pronunciation system, Southern American English now comprises the largest American regional accent group by number of speakers. 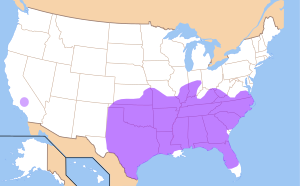 As of 2006, its Southern accent is strongly reported throughout the U.S. states of North Carolina, South Carolina, Georgia, Alabama, Mississippi, Tennessee, Arkansas, Louisiana, and Kentucky, as well as most of Texas, eastern and southern Oklahoma, southern Missouri, southeastern Maryland, Virginia, West Virginia, northern Florida, and southeastern New Mexico. The accent of some Midland American English (often identified as a South Midland accent) is documented as sharing key features with Southern American English, though to a weaker extent, including in northern Oklahoma, eastern and central Kansas, Missouri generally, the southern halves of Illinois and Indiana, southern Ohio, western Delaware, and south-central Pennsylvania. The starting point, or first stage, of the Southern Shift is the transition of the gliding vowel (diphthong) /aɪ/ ( listen) towards a "glideless" long vowel [aː] ( listen), so that, for example, the word ride commonly approaches a sound that most other American English speakers would hear as rod or rad. Stage 1 is now complete for a majority of Southern dialects. Southern speakers particularly exhibit the Stage 1 shift at the ends of words and before voiced consonants, but often not before voiceless consonants, where the diphthong instead retains its glide, so that ride is [ɹäːd], but right is [ɹäɪt]. Inland (i.e. non-coastal) Southern speakers, however, indeed delete the glide of /aɪ/ in all contexts, as in the stereotyped pronunciation "nahs whaht rahss" for nice white rice; these most shift-advanced speakers are largely found today in an Appalachian area that comprises eastern Tennessee, western North Carolina and northern Alabama, as well as in central Texas. Some traditional East Coast Southern accents do not exhibit this Stage 1 glide deletion, particularly in Charleston, SC and possibly Atlanta and Savannah, GA (cities that are, at best, considered marginal to the modern Southern dialect region). By removing the existence of [aɪ], Stage 1 leaves open a lower space for /eɪ/ (as in name and day) to occupy, causing Stage 2: the pulling of the diphthong /eɪ/ into a lower starting position, towards [ɛɪ] ( listen) or to an even lower and/or more retracted sound. Back Upglide (Chain) Shift: In Southern regional dialects, /aʊ/ shifts forward and upward to [æʊ] (also possibly realized, variously, as [æjə~æo~ɛɔ~eo]); thus allowing the back vowel /ɔː/ to fill an area similar to the former position of /aʊ/ in the mouth, becoming lowered and developing an upglide [ɑɒ]; this, in turn, allows (though only for the most advanced Southern speakers) the upgliding /ɔɪ/, before /l/, to lose its glide [ɔː] (for instance, causing the word boils to sound something like the British or New York City pronunciations of balls). Bernstein, Cynthia (2003). "Grammatical features of southern speech". In Stephen J. Nagel; Sara L. Sanders. English in the Southern United States. Cambridge: Cambridge University Press. ISBN 978-0-521-82264-0. Cukor-Avila, Patricia (2003). "The complex grammatical history of African-American and white vernaculars in the South". In In Stephen J. Nagel and Sara L. Sanders. English in the Southern United States. Cambridge: Cambridge University Press. ISBN 978-0-521-82264-0. Hazen, Kirk & Fluharty, Ellen (2004). "Defining Appalachian English". In Bender, Margaret. Linguistic Diversity in the South. Athens: University of Georgia Press. ISBN 978-0-8203-2586-6.